Surprise! Surprise! Surprise! The PSJHOA is no longer around! Three cheers! They decided at the March 14, 2005 meeting to dissolve the organization, as you can read for yourselves in their newsletter, above. So there is no more PSJHOA to have a Treasurer who scratches, pushes, hits and shoves. No more closed, locked door meetings with the President spending ninety minutes slandering the two people who happen to shine the light of truth on things the organization was doing. No more meetings where business is conducted without a quorum, the minimum number being 21 people out of 120 members (read it in their own newsletter, folks, I didn't make this up). No more scare tactics from that organization on everything from septic tanks to desalination plants to the Willow Creek development. So far, at least. I am checking the Florida Division of Corporations website (link on my government page) as I write this to make sure that they aren't forming under a different name with about the same set of people: nothing yet. But that doesn't mean it isn't coming. I trust some of these people about as much as I can stand to hear them speak: which is about a single syllable. So I'm going to keep watching. There's something brewing with a certain polivist: she's trying to stack the decks again. She's trying to get like-minded people on the PSJ Advisory Board and I'm trying to shut that Board down. All kinds of fun! The following transcipt is breaking my own rules. I have never published this much in the way of notes from the Board meetings of the PSJHOA. However, considering the events of June 14, 2004's meeting, I feel compelled to tell you this portion of the discussion. This is the truth, folks. Amazingly, the truth. Please be prepared for a shock. ALL of the people at the meeting, except Pete Costello and I, were Officers of the Port St. John Home Owners' Association and/or Board members of the organization. I arrived at the PSJ Community Center at approx. 6:45 PM for the Port St. John Home Owners' Association Board of Directors meeting. As a member, I thought I would be welcome. I waited in the lobby for Pete Costello, but he didn't show. While waiting I spoke to Julie, one of the Center employees, about something. When Pete didn't show up by 7 PM, I went to the meeting room and sat down in a chair close to the door, with my back to the door. Ed Warner (Board Chair), Vicki Smith (Secretary), DJ Olson (Treasurer) and Bob Lewis (Board member) were there. I asked where Helen was. They said she had another meeting and she'd be here soon. I took out my notepad only (not my tape recorder) and set-up to take notes. Helen Dezendorf (President) arrived, as did Pete Costello (member of the org., but not a Board member) and Gay Keebler (Board member). The meeting was started and the minutes were read. The desal plant was discussed a little by someone saying there's a desal plant on the Ascension Islands that doesn't work properly. It backs up and when it does work, people get bad reactions on their skin and eyes. About this time, a Board member, Jay Phillips, showed up. Helen said that the HOA newsletter is supposed to be online at their website by April of 2005. The NNNO will be from 6:30 to 8:30 PM on Aug. 3rd. PSJ Bulletin.com's prize sponsorship offer was discussed a little and that's when D.J. Olson said that she had a problem with us being there and with me taking notes. Board Chairman, Ed Warner, looked at me and said in a very angry tone, "You're out of line, young lady." (Young lady? How very patronizing.) He insisted that I stop taking notes. He said that they had taken a vote and that I couldn't take notes any more. He got angrier and angrier and kept telling me to stop taking notes, then he said that he would call the police and have me removed from the meeting if I didn't stop. Someone said that I was publishing the notes I took at the Board meetings. Ed got even angrier and said that if I didn't stop taking notes, he was going to call the police. He stood up and said it again and again. I had the minutes from the General Membership meeting where the motion with the with me and I took them out to be able to have the exact quote. Pete Costello told Ed that he didn't have a leg to stand on and that the rule was rather ambiguous. Ed went to the door and gave me one last opportunity to stop taking notes. I kept taking notes and just looked at them. Ed left the room and Helen prevented discussion while he was gone. Ed returned and said that he had called the Deputy. He said it's up to me to decide: if I want to stop taking notes, he will call and cancel. D.J. Olson said that she thinks that because I am a member of the organization that I should not be writing things against the association. It was about this time (approximately 7:45 PM) that the Deputy showed up and Ed went out to talk to him. Ed returned shortly and sat down. I was not arrested, nor even removed from the room. Someone commented that it's not good for me to take notes and tell people what's going on in the HOA and their Board meetings because it's not anyone's business what the HOA does. Gay Keebler said that she has a problem with me being there wearing a PSJBulletin.com badge. Which am I: a member, or a reporter? D.J. Olson said that "it's not a real badge anyway." Without saying a word, I took the badge off and dropped it into my tote bag. Someone said that I can't walk into a Ford [Motor Company] Board meeting and take notes there and tell people what happened. It was about this time that someone mentioned that they had to vote a member off the Board a few years back. Vicki Smith said that people who participate -- as in speak during the meetings -- have to give permission for their words to be published, not everyone who attends. Helen contended that I can attend and take notes, but that I can't publish any of my notes. It was about this time that things settled down and the meeting went on. End of Board notes: see comment below. I use "someone" within the notes because I don't recognize every voice and when I'm writing, I'm looking at my paper, not at who is speaking. Now, how much do you think their little First Amendment trampling time cost the Brevard County tax payer? 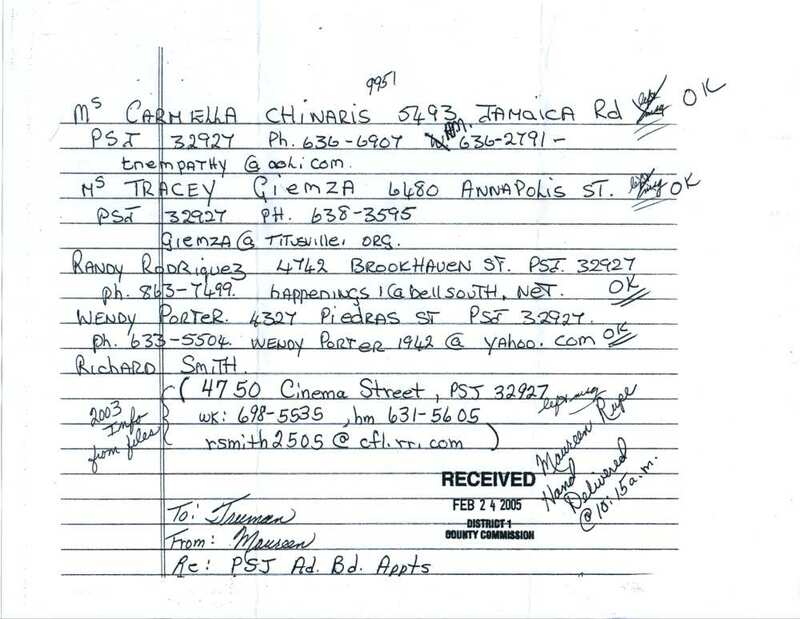 I talked to someone at the Community Center today (June 15, 2004) and this person said that there are about three levels up that have to spend time on the paperwork for the incident report that had to be filled out about this (they call the Sheriff, an incident report has to be filled out). And after those levels take a look at it, then the paperwork has to go to Risk Management at Viera and they have to look at it. Think of the Sheriff's Deputy who came to this little temper tantrum call and who could have been preventing a crime, or answering a more important call and of the wear and tear on his vehicle to drive there from wherever, the gas it cost the Brevard County tax payers and the paperwork up the line for his report. How much do you think all of that cost us? And all of that was paid so that they could try to shut me up. Was it worth it to you? What they didn't realize at the time was how much it was costing the HOA in reputation and in respect from the community. They didn't think at the time that the tyrade would cost them because the word would get out. And not only by me and my website; there are other people talking about this. But the HOA Board didn't realize that the First Amendment is for you and for me. And it won't be silenced, either. You have the right to speak. You have the right to tell them what you think. Why not do that? 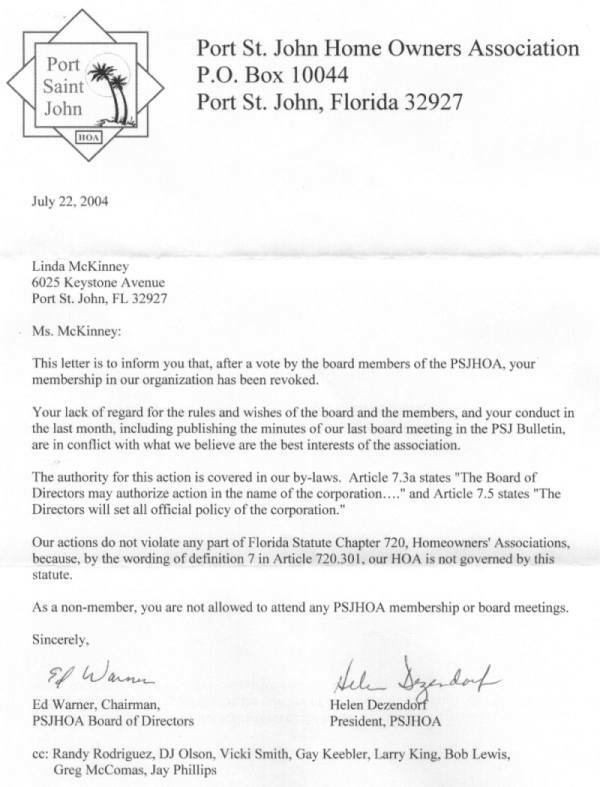 Contact Helen Dezendorf, President of the PSJHOA, and tell her what you think of this effort to silence the truth. Tell her that the First Amendment is not going to be trampled by a little HOA trying to keep secrets. There are a few of you who know that I have resigned my position as Vice President of the Port St. John Home Owners' Association. Now the rest of you know. I find it too difficult and stressful to work under the pretense that the past never happened, that we all get along and that we are not on opposite ends of the political spectrum. I believe in the statement that if we do not learn from the past, we are doomed to repeat it. After the incorporation battle (which I am determined to get a history page made about some day), I do not think we should ever forget that it happened and what the pro-incorporation side tried to do to us and the Four Communities; especially after the tactics they used! We should remember it, learn from it, and work hard to ensure that it is never repeated! Between that and the little things that go together to make big things (more later on that), and after talking to my family, I decided that it is easier to fight them from the outside of the Board and Officer ranks. So, I resigned to get out of the stress, but to make the battle easier. I do apologize if you feel that I let you down. It is my sincere desire to keep the battle going, but to make the fight easier on myself. I thought I'd do something different to my website and this is it. Now you can find my PSJ HOA pages easier, faster and in little bits and pieces. To get to the January 2003 notes of the PSJ HOA General Membership meeting, just click on the 1st Quarter, 2003 link and you'll be taken to the January, February and March notes. That makes it easier to find things because you won't have to scroll down such a long page to get to the most recent notes. It also makes it easier for search purposes, as well. If you can remember that something happened in March, but you want to make sure you have the correct "recollection" of it, then it will be easier to find those notes. Also, please note that the quarters are listed with the first notes I have at the bottom, to the most recent at the top. That will also make it easier, I hope. I also put lines between the notes of each meeting to make it even easier. Also, please remember that these notes are my notes, not the official records of the PSJHOA, not the opinions of the PSJHOA, nor the stance that the organization as a whole decided to take on any subject. I want to make that perfectly clear. The notes are taken directly from a recording I make during the meetings, and from my notes during the meeting. I take those notes and the recording and sit down at my computer and type in the information -- not verbatim, unless it's important that it be verbatim (my call to make). The first notes are from November of 2002, and those notes are more general impression than anything else, but they may come in handy. If you have questions or comments, please feel free to contact me [Replaced from previous owner] and I will see what I can do to help.